One of the most enduring , and inspiring, stories of a saint is that of Veronica. Little is known about her life, but she lived at the same time as Jesus and was present during his trails on Good Friday. While Jesus carried the cross, he was shouted at and spit upon by a furious, almost uncontrollable crowd; his face was covered in sweat, blood and mud, and he was having difficulty remaining on his feet. Watching Jesus fall was so painful for Veronica that she stepped out of the angry throng, despite the risk to her own life. With true compassion, she knelt in front of Jesus and used her veil to gently wipe his face clean. This simple act of kindness still resonates all over the world. In fact, the event is commemorated on the sixth station of the cross (as series of images depicting scenes in Christ's Passion). 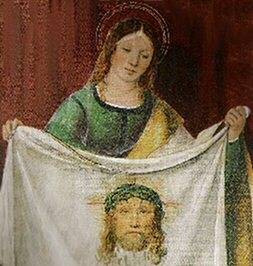 After soldiers pushed her away, Veronica went home and discovered that Christ's face was imprinted on her veil. It is believed Veronica later traveled to Rome, leaving the veil in the care of Pope Clement I ad his successors. Her name and legend is aid to have come from the words vera icon (true image), which is what the veil was called. Throughout history, Veronica herself as well as her veil have been part of various legends. According to the popular Italian legend, the veil was used to cure the Roman emperor Tiberius of an illness. French legend holds that Veronica came to the region of Bordeaux shortly after the Ascension of Christ, and preached there for many years. In all its many forms, Veronica's story is a lesson about selfless compassion, and inspires us to show love for each other. The anxiety St. Veronica must have felt when she stopped out of the raging crowd is not unfamiliar today. How many times have we been afraid to stand up against the mainstream way of thing, even when we know it would be the right thing to do? Like Veronica, we are all human -- and we can all learn from her act of kindness. Veronica's story can inspire us to show compassion, even when it's not easy.